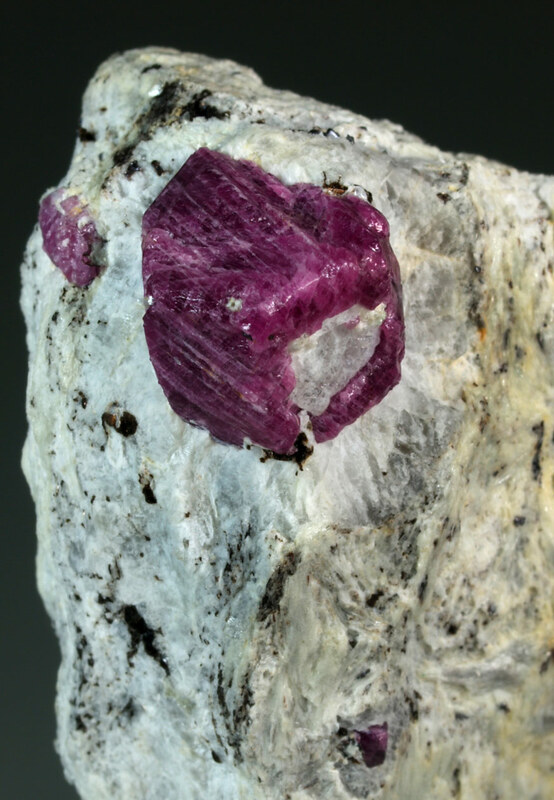 A stunning corundum, var. 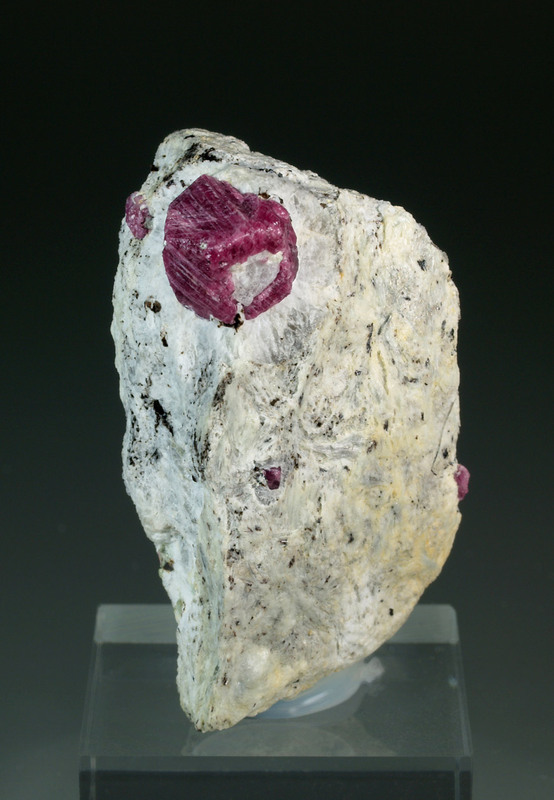 ruby, specimen. Perfectly disposed and contrasting with the white matrix. 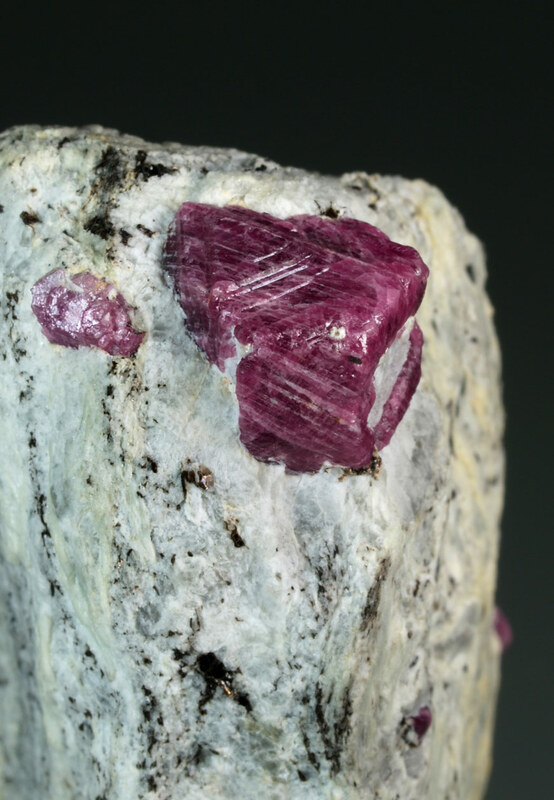 Very sharp, translucent, brilliant and with a deep reddish color not ususal in this locality. Very fluorescent under LWUV. A perfect gem from India. Size: 5.5 x 3.0 x 2.5 cm. Ex Chris & Agatha Galas collection. 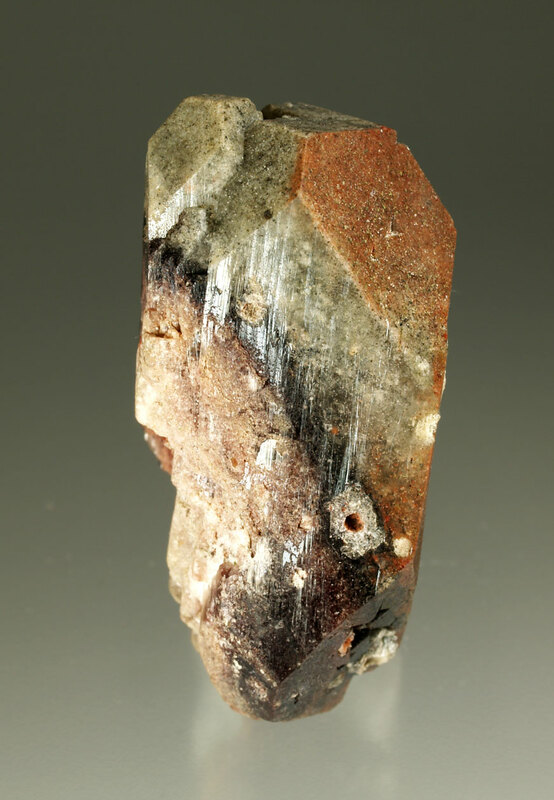 Excellent doubly terminated crystal of apophyllite-(KF) showing perfect tetragonal prism faces, well developed, with the dipyramid and pinacoid. 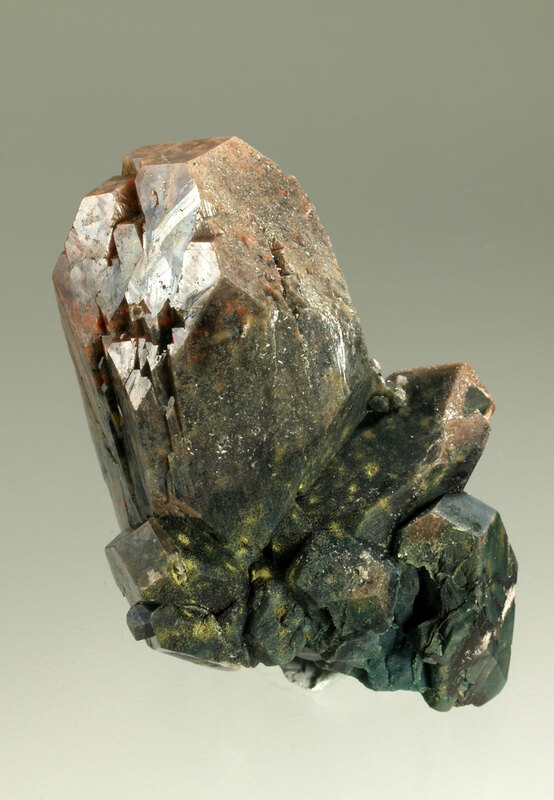 The edges are very sharp and the faces have some striation. 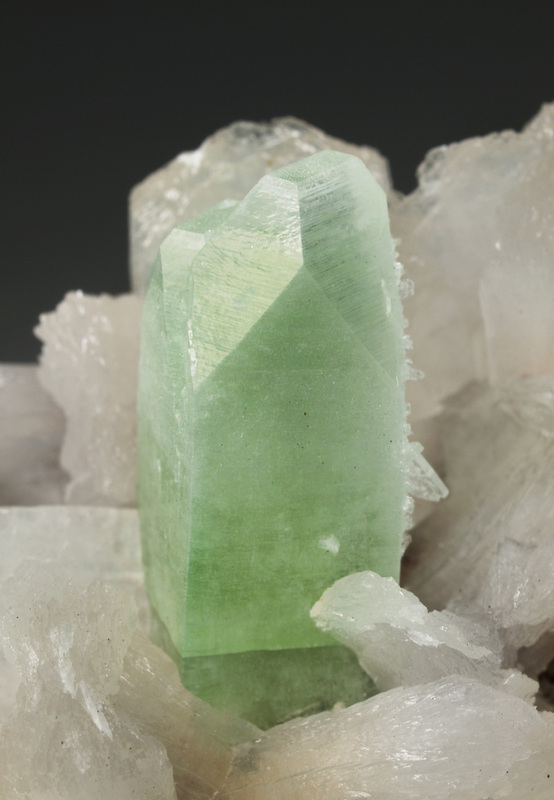 Translucent and slightly green color zoning, more intense in the crystal core. 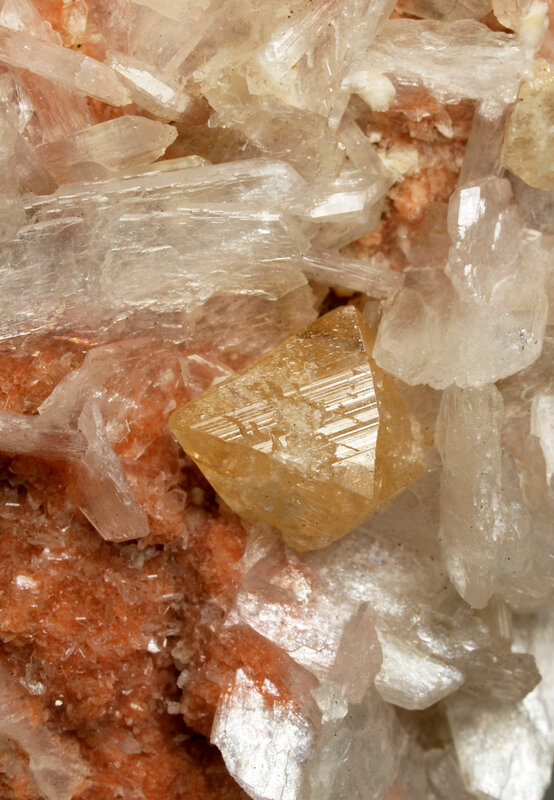 Faces are peppered by small white calcite crystals that have grown curiously mostly in some orientated faces, probably due to water circulation. It is very, very aesthetic. 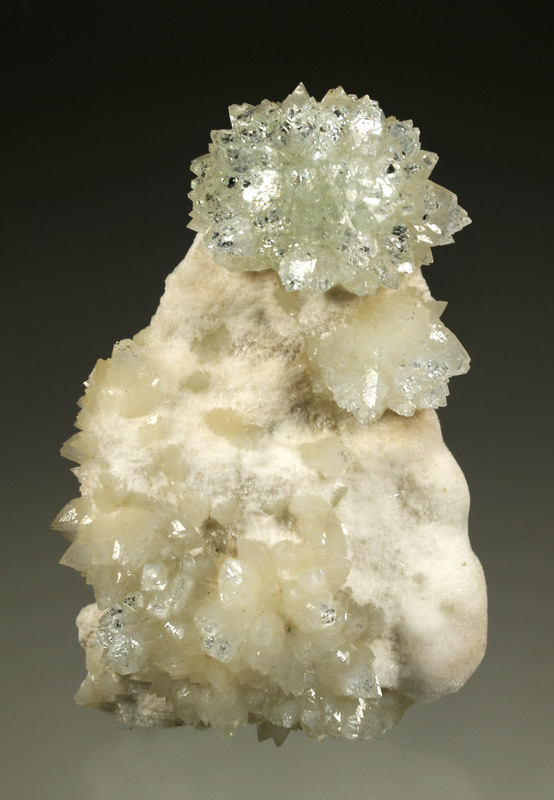 On a matrix of very bright and transparent crystals of stilbite also peppered by small calcite rhombohedra. These specimens were found in 2006 in a small Indian village, when they were drilling a water well. They found a cavity totally covered with them. 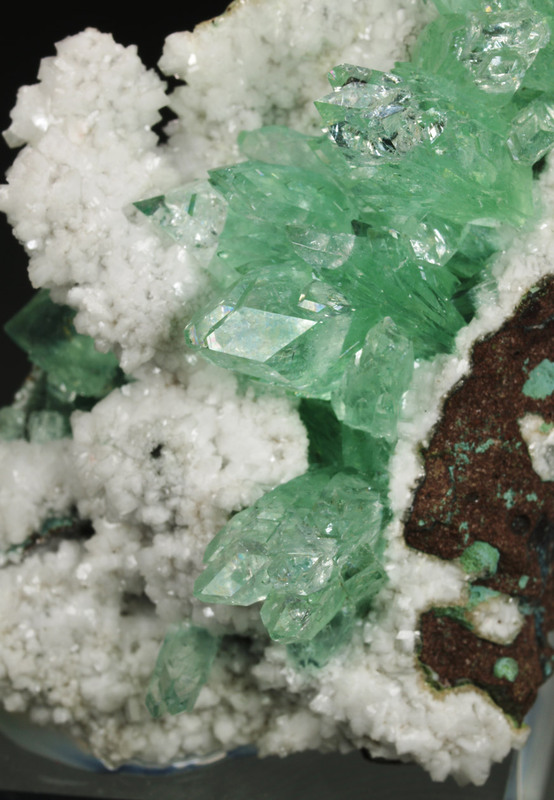 There is an interesting article in the Mineralogical Record magazine (39:267-273). Size: 7,0 x 4,5 x 4,3 cm. 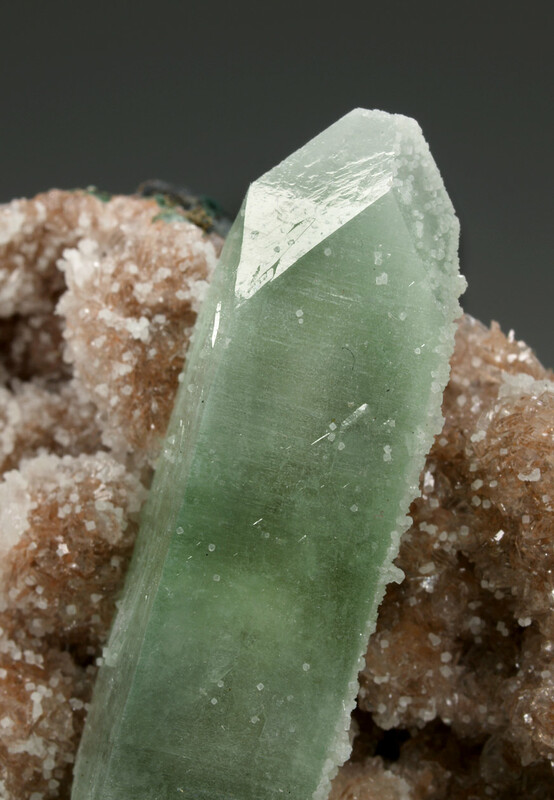 Main crystal: 40 x 10 mm. 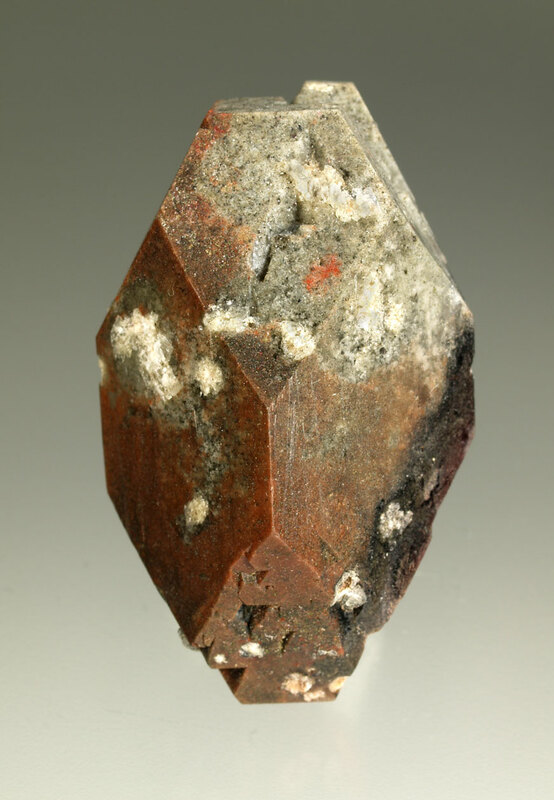 Group of two apophyllite-(KF) crystals showing perfect tetragonal prism faces, well developed, with the dipyramid and pinacoid. 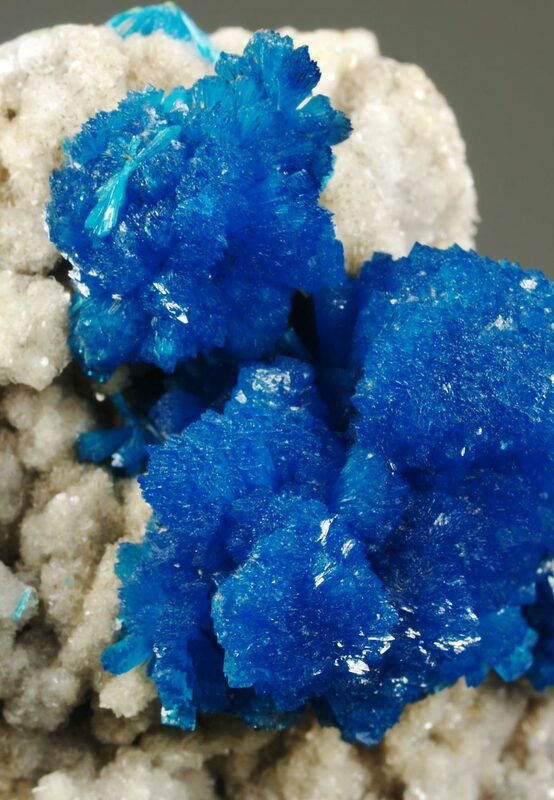 The edges are very sharp and the faces have some striation. 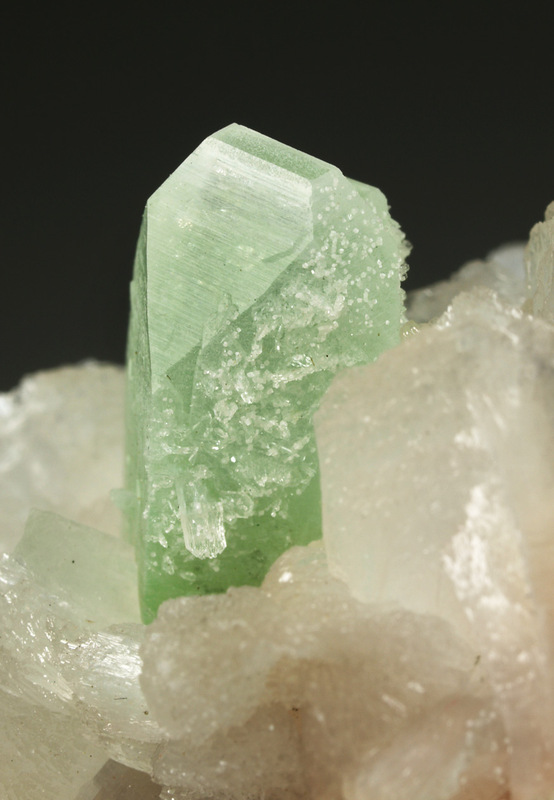 Translucent and slightly green color zoning, more intense in the crystal core. 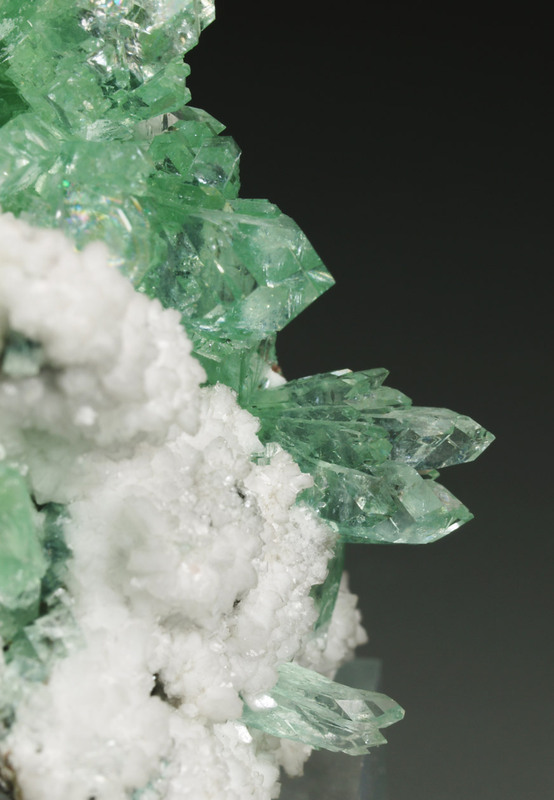 Faces are peppered by small white calcite crystals that have grown mostly in some orientated faces, probably due to water circulation. It is a very aesthetic miniature. 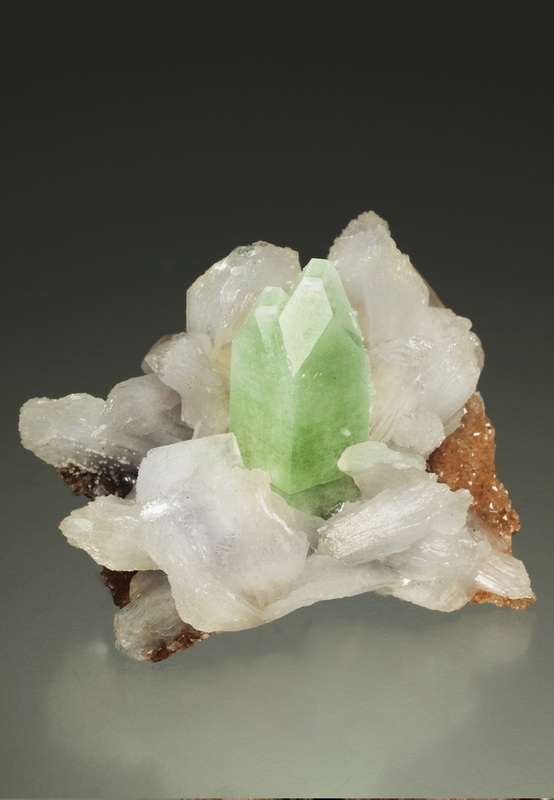 On a matrix of very brilliant crystals of stilbite. Size: 4,5 x 3,5 x 2,5 cm. 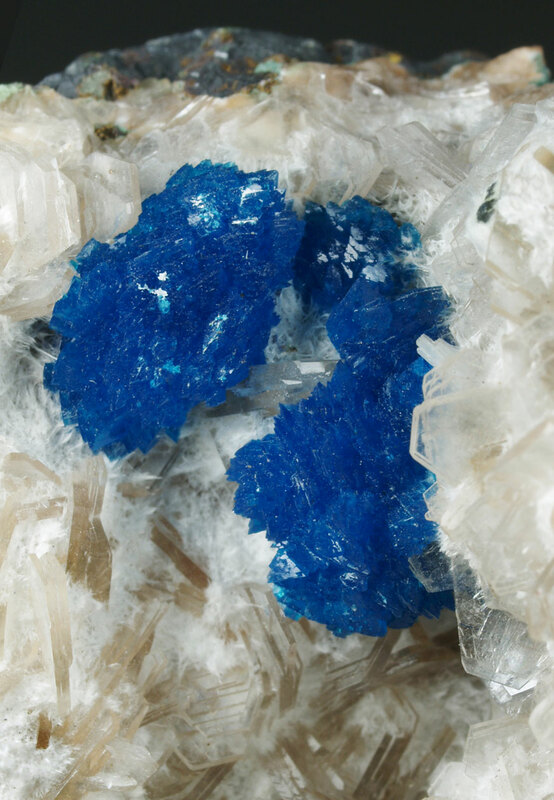 Main crystal: 22 x 12 mm. 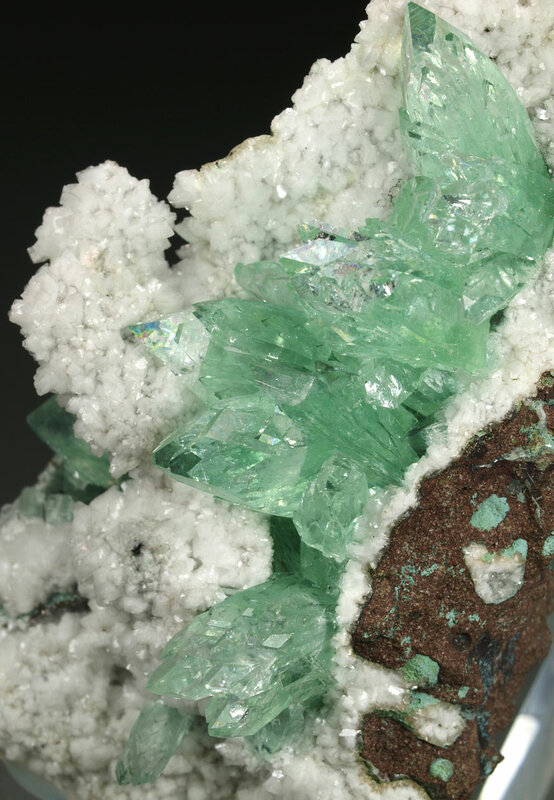 Very aesthetic aggregate of globular gyrolite with defined fluorapophyllite crystals. Nice miniature. Size: 5.4 x 5.2 x 1.4 cm. 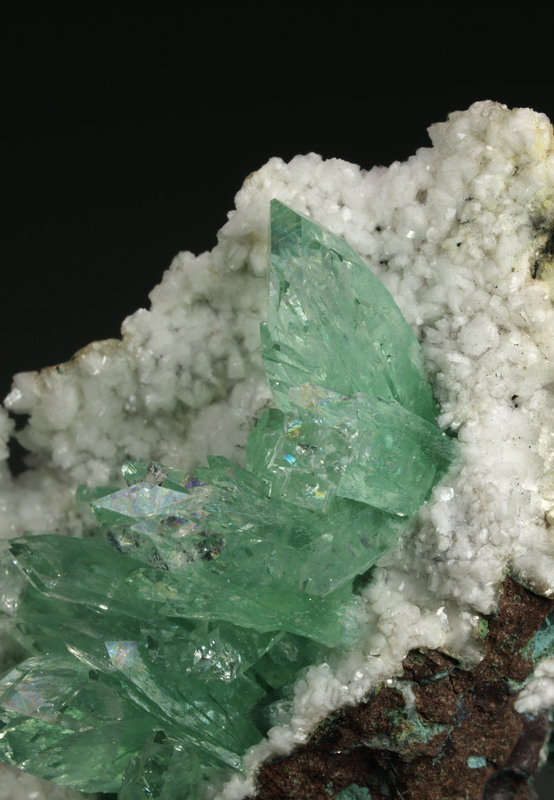 Group of huge sized fluorapophyllite-(K) crystals, one of them dominant and doubly terminated. 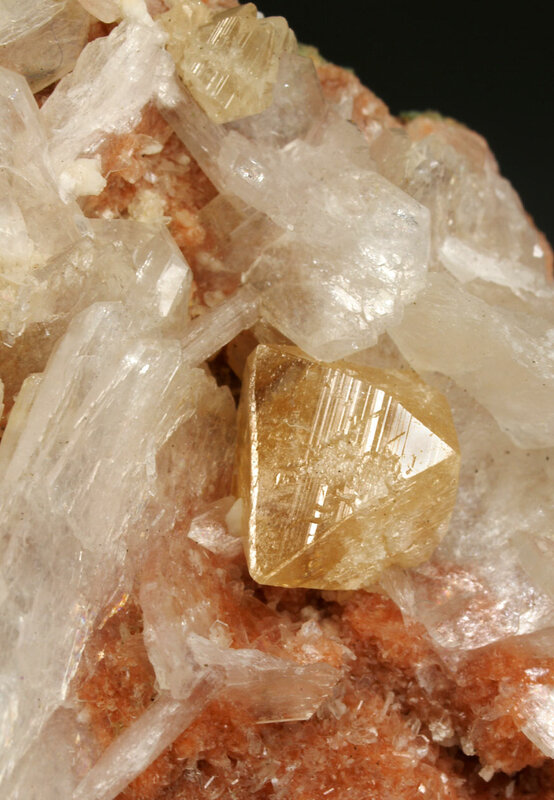 They present forms of the prism and dipyramid tetragonal. Brilliant and defined. 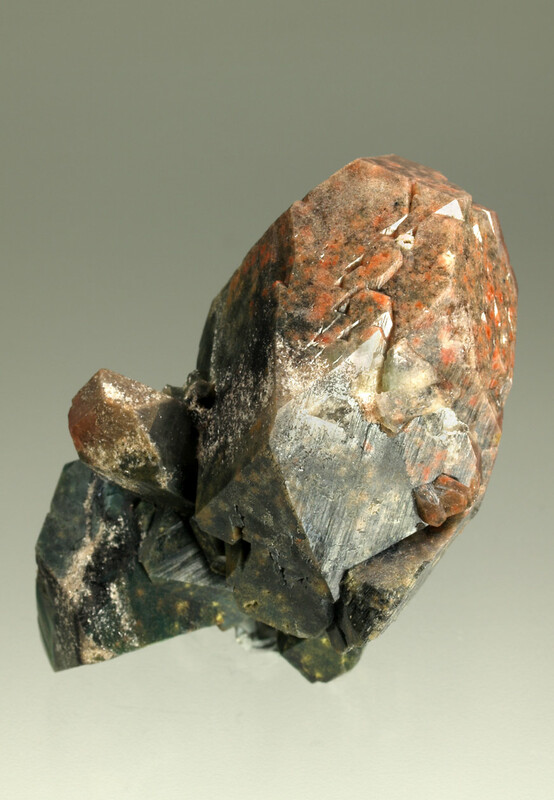 Particular greenish to reddish inclusions, probably by chlorite and iron oxides. A very interesting specimen. Size: 6.7 x 4.5 x 3.8 cm. 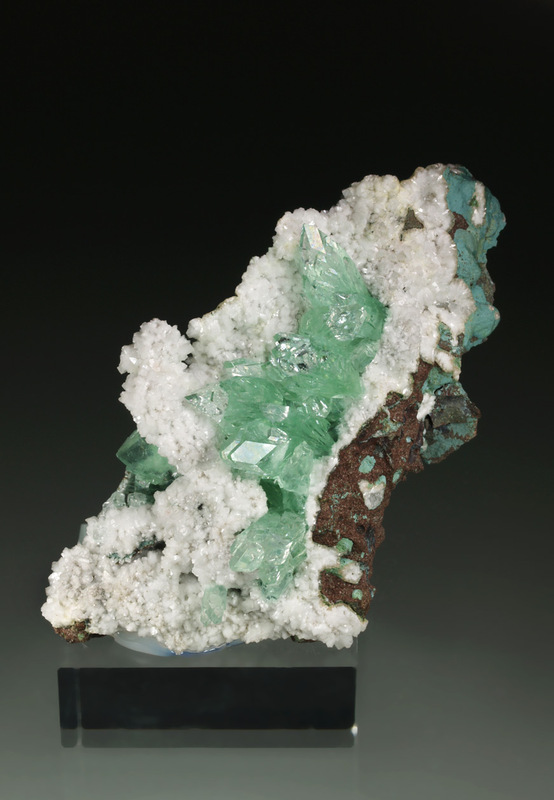 Main crystal: 50 x 35 mm. 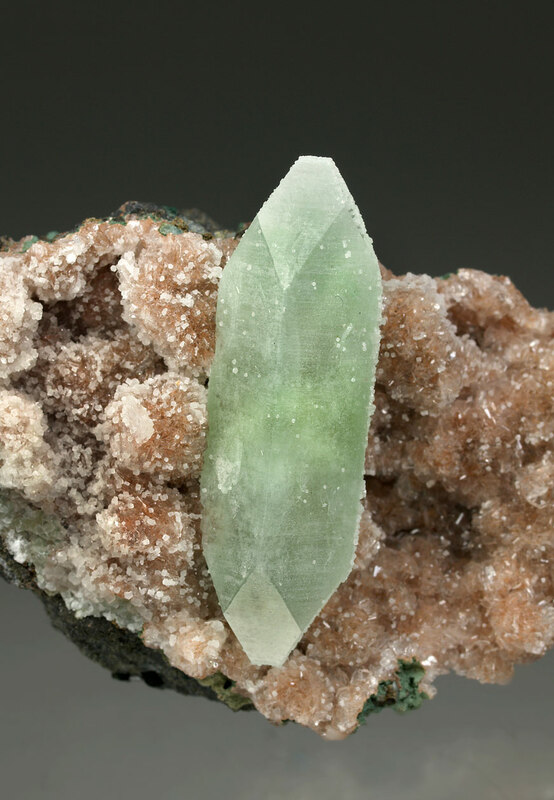 A very sharp and brilliant fluorapophyllite-(K) doubly terminated crystal with good size and showing the forms of the tetragonal prism, dipyramid and pinacoid. 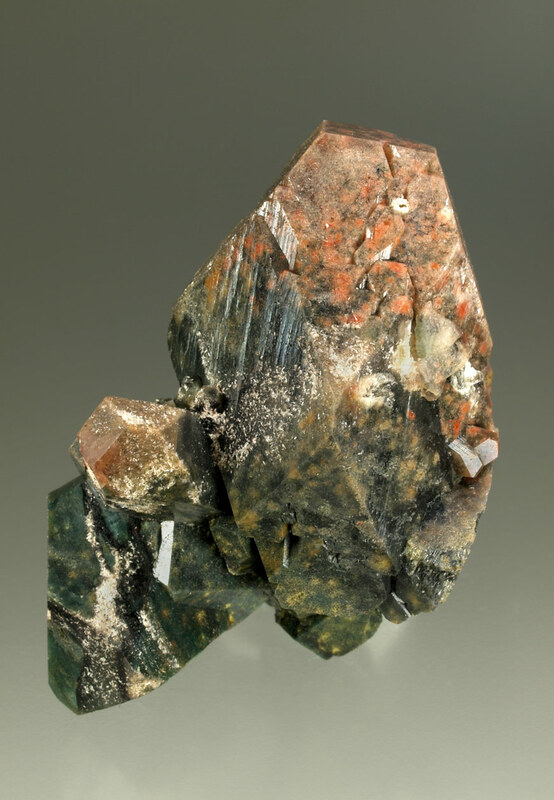 Note the greenish to reddish inclusions, probably chlorite and iron oxides, that we can see in the back side. A very interesting specimen. Size: 5.2 x 2.6 x 2.5 cm. 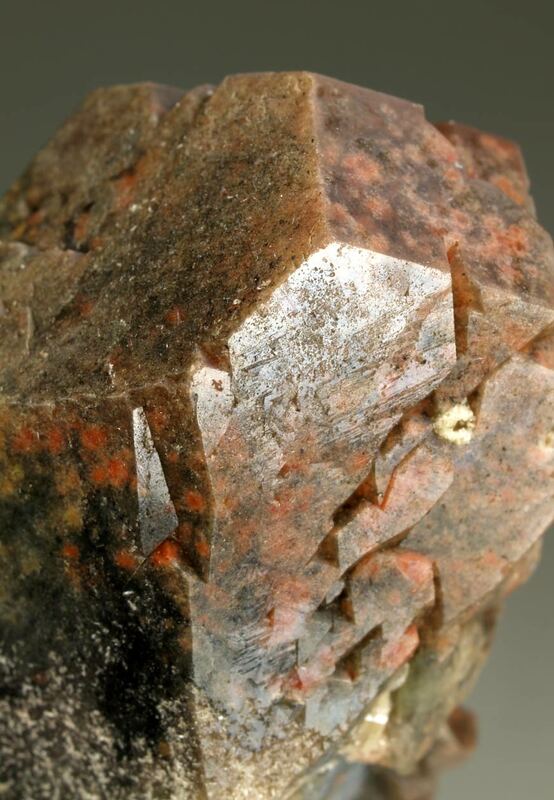 Bipyramidal crystal of powellite with a good size, very brilliant and well defined faces and edges. With a delicate honey color and some transparence. 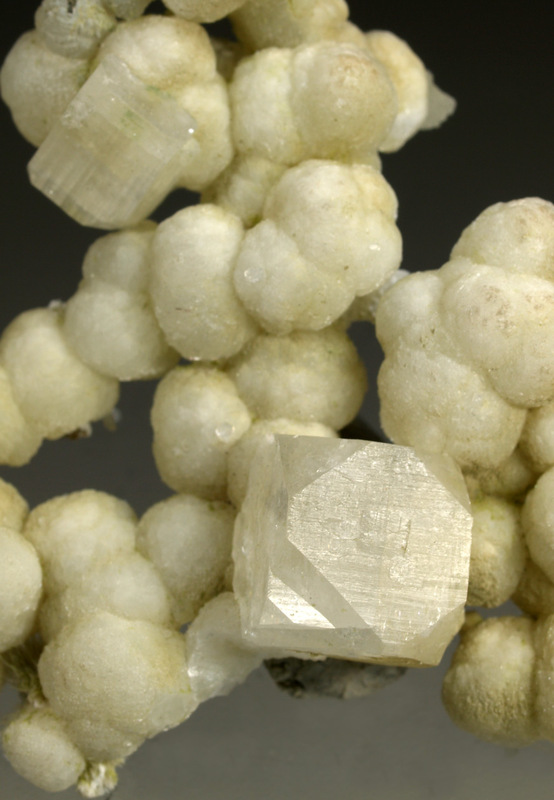 It is accompanied by stilbite crystals on matrix. Size: 6,7 x 6,0 x 3,2 cm. 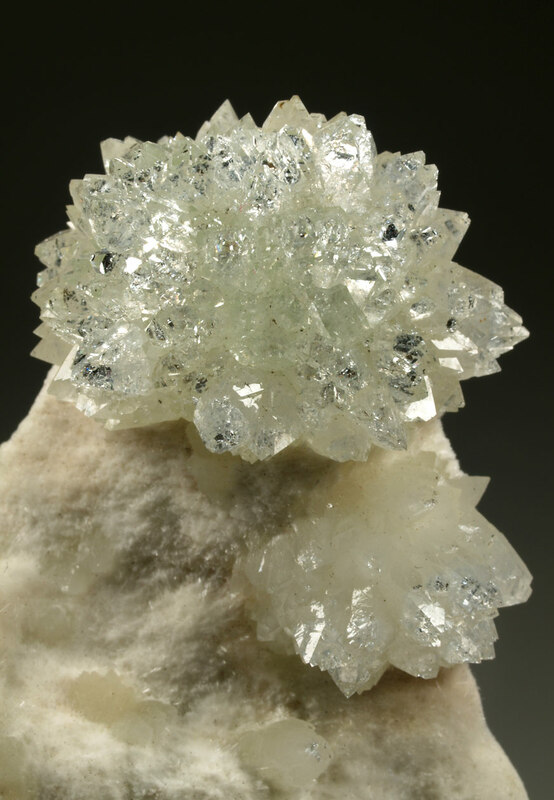 Very aesthetic specimen formed by several groups of fluorapophyllite-(K) rosettes, very brilliant, defined, colorless (with a slight greenish tone) which are disposed very aerial on a matrix with Stilbite-(Ca) and fine white needles of okenite. A novelty at Sainte-Marie-aux-Mines 2015. Size: 8.0 x 5.0 c 2.8 cm. 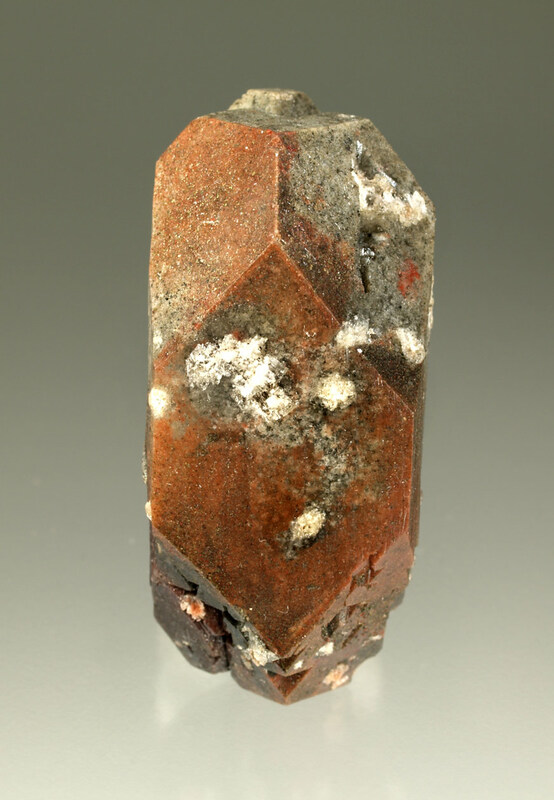 Main crystal: 34 x 30 mm. aggr. 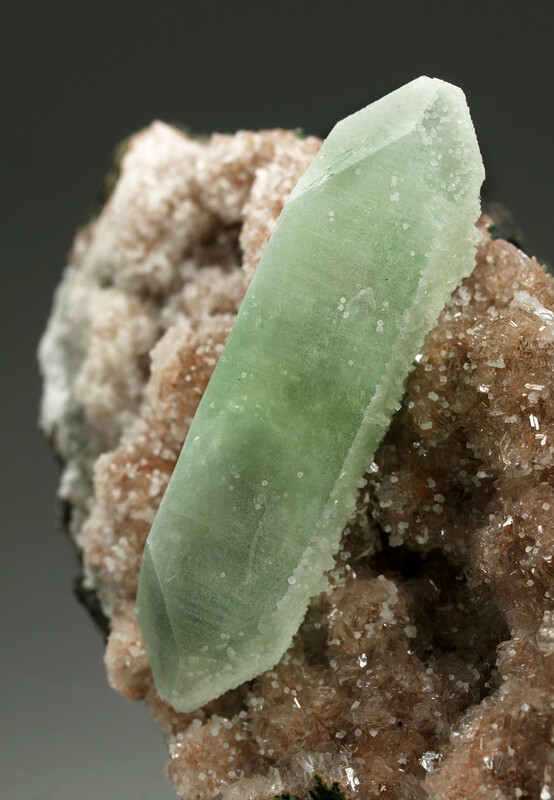 Excellent specimen of fluorapophyllite-(K) formed by several crystals, very aerial disposed and transparent, with an intense green color, and tetragonal forms of the prism and the dipyramid very visible, with parallel growths. 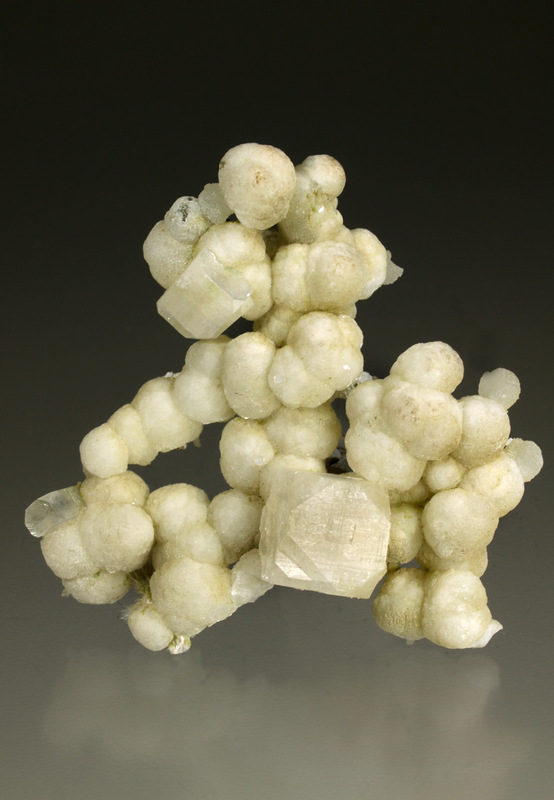 They are disposed contrasting with a snowy white matrix of lanceolated crystals of heulandite-Ca. 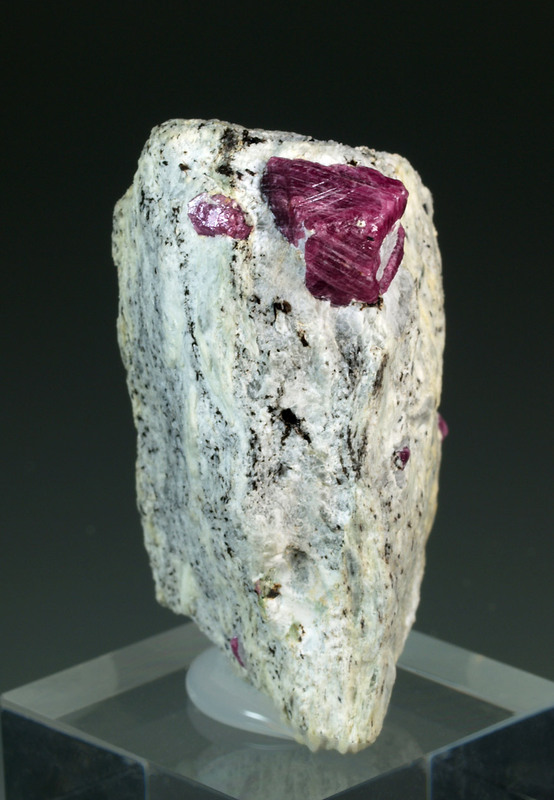 A gemmy specimen. Size: 7.3 x 4.8 x 2.5 cm. 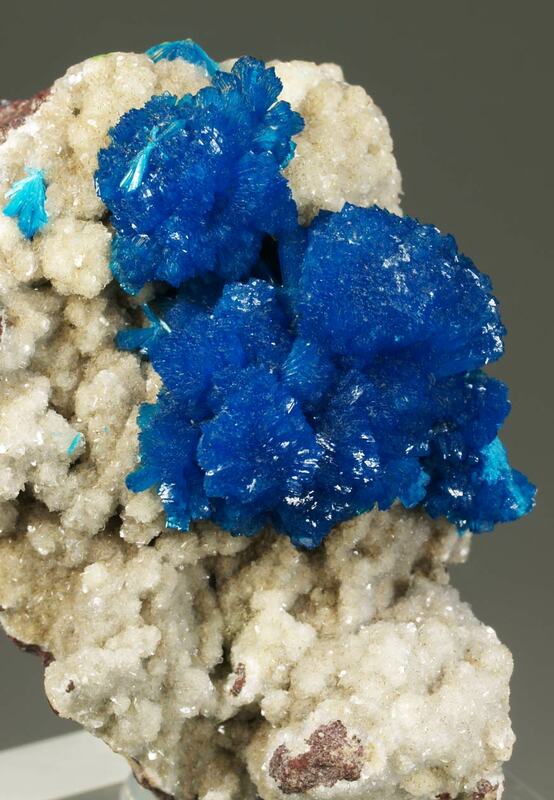 Globular aggregates with a really good sized formed by cavansite lanceolate crystals, with an intense blue color, brilliance and transparence. 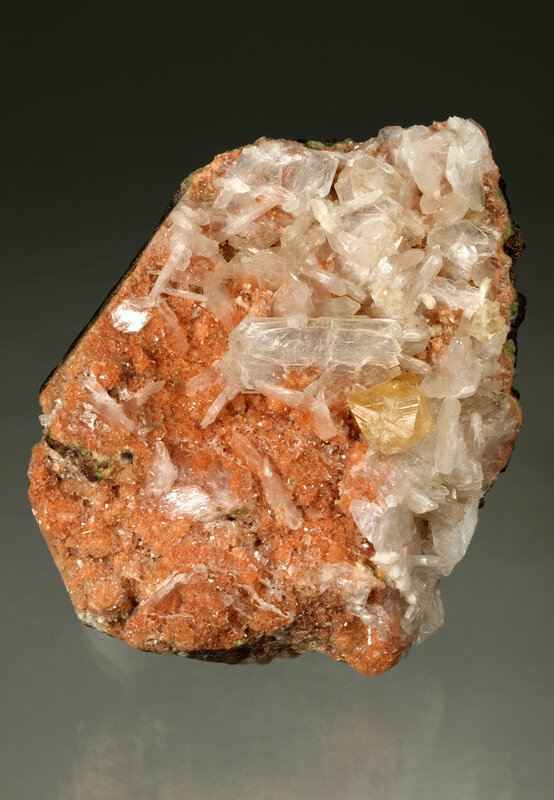 Very aerial and aesthetically disposed on the matrix covered by several small but transparent and brilliant stilbite-Ca crystals. 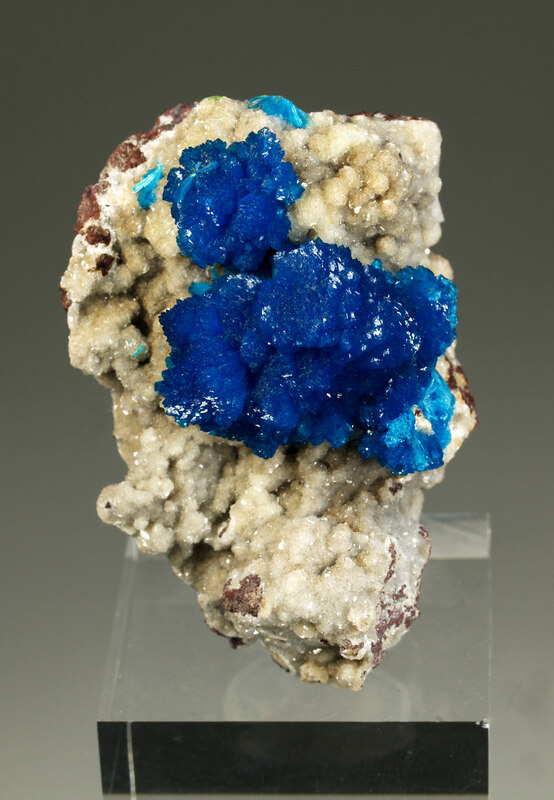 Size: 5.5 x 3.8 x 3.5 cm. 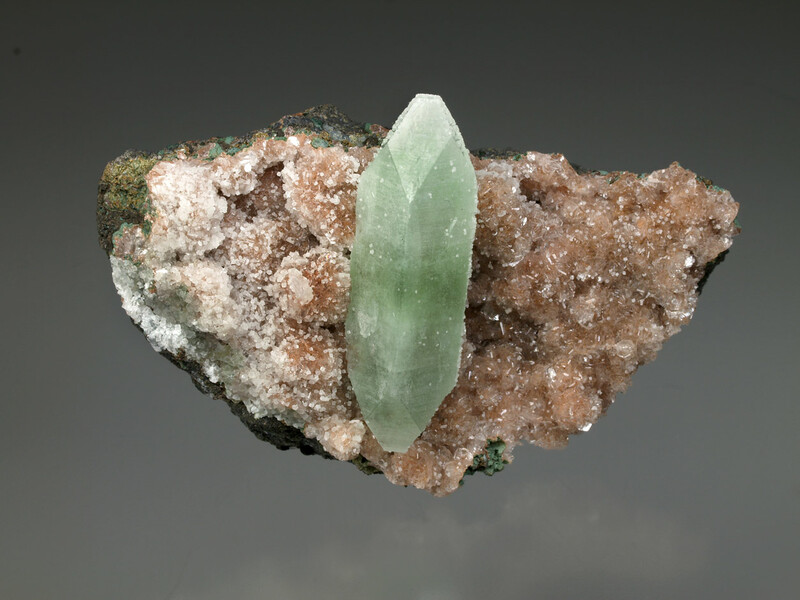 Main crystal: 3.3 x 2.8 cm. aggrs. 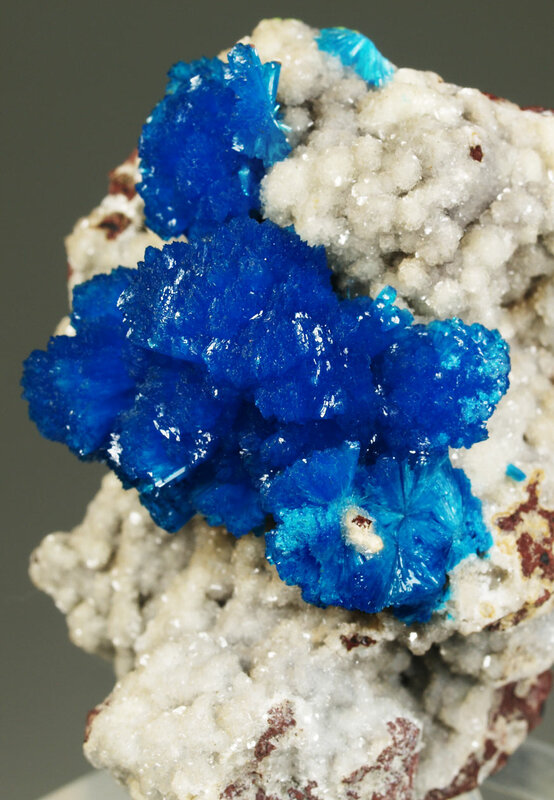 An aesthetic royal-blue cavansite group of sharp crystals, perched atop stilbite-covered basalt matrix on this fine and showy piece from the Wagholi Quarry of India. 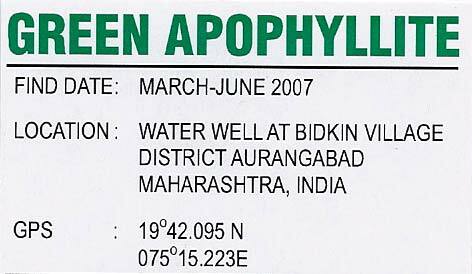 Size: 7.0 x 5.5 x 4.5 cm. 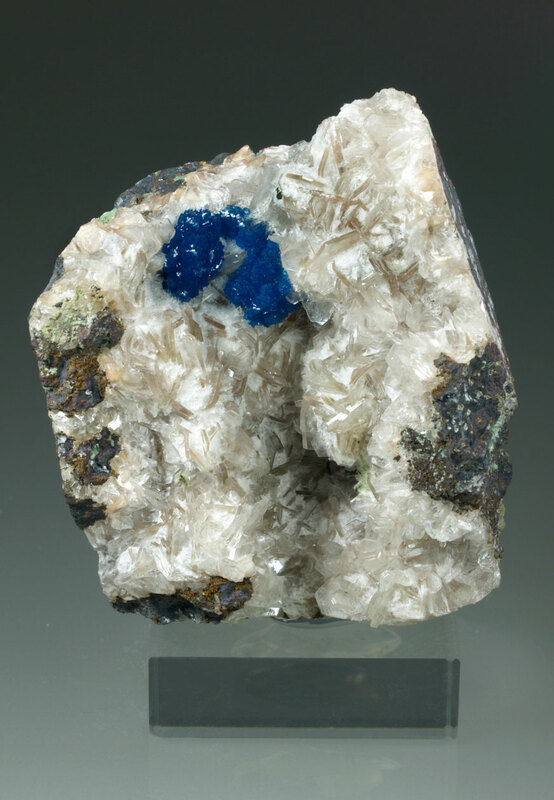 Main crystal: 18 x 14 mm aggreg.